Parken verboten, 2001, b/w, 8 min. 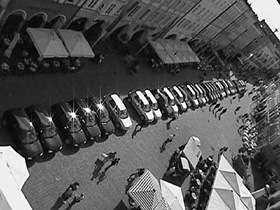 Video film documents the action-installation PARKEN VERBOTEN, held by the author, on the main square in Rosenheim (autumn 2000). By parking 45 new, black and white cars (VW Golfs) in a 130 m long row along the Max-Josefs-Platz a binary coded message is written. The action provokes curiosity, interest and anger from passers-by. The process of writing and that of reading are intertwined in the lively social tissue of the city.